For the first time since joining the Louisville Cardinals, Miami native Teddy Bridgewater will face the team he initially committed to -- the Miami Hurricanes -- in the Russell Athletic Bowl in Orlando, Fla.
ORLANDO, Fla. — Teddy Bridgewater insists he’s no longer the type to keep his emotions bottled up. But when the conversation turns to him facing the University of Miami in the Russell Athletic Bowl on Saturday night, the Louisville quarterback and Miami native prefers to stay in the pocket with his feelings. "There aren’t any emotions at all because it’s just another game, another opponent on the schedule, another opponent in the way of something we’re trying to accomplish," Bridgewater said earlier this week after the Cardinals arrived in town to prepare for the Hurricanes. "We’re trying to have a 12-win season here, and we’ve been able to do some great things all year. "Playing against these guys is a great feeling, but it’s no bigger than any other game." Those familiar with Bridgewater from his years at Northwestern High School, where one scouting service had him listed as the No. 2 quarterback recruit in the country and the 16th-best player in the state of Florida, might beg to differ. Bridgewater initially committed to Miami after being a three-year starter at Northwestern and helping lead the program to the 6A state championship game, which was played at the Citrus Bowl, as a sophomore. That oral commitment was made while Randy Shannon was still coaching the Hurricanes. After Miami fired Shannon following the 2010 season, Bridgewater wasn’t as keen on the possibility of succeeding another Northwestern product, Jacory Harris, in running the offense at one of country’s most recognizable programs. "When I was being recruited, I knew a ton of the guys already on their roster who were there from my high school," he said. "So I would hang out with those guys down there to see what it was like." Bridgewater described the process which led to him changing his mind as "pretty tricky." Part of that included an NCAA investigation of the Hurricanes which centered on former booster Nevin Shapiro, who reportedly brought Bridgewater to his suite for a home game in November 2008 and gave him complimentary food and drinks. While Bridgewater expressed interest in coming to LSU, the feeling was not mutual. "They wanted me to reschedule (a visit) because they were flying out to California to see Zach Mettenberger," he said. "So when they told me that, I just felt that I wasn’t a priority. I wanted to go somewhere where I would be happy." That wound up being Louisville, where former Miami assistant coach Clint Hurtt resurfaced after his failure to disclose elements of his relationship with Shapiro landed him in hot water with the NCAA. "Once I remembered who he was and I finally met him again, everything just clicked," Bridgewater said. His three years at Louisville have established the school as a powerhouse in more than just basketball. 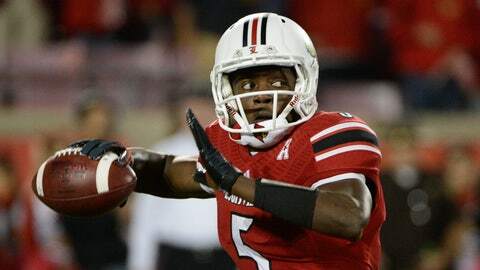 After setting the Cardinals’ single-season record for passing yardage by a freshman, Bridgewater emerged on the national scene as a sophomore despite fracturing a wrist in a loss to Connecticut. His MVP performance in the Cardinals’ victory over Florida in the Sugar Bowl served as a springboard for a junior year in which both his completion percentage and touchdown passes thrown went up. But between blowing a 21-point lead at home in a loss to UCF and seeing Bridgewater’s passing yardage totals drop, the season has been generally regarded as a letdown. "I think I had a good year," said Bridgewater, who didn’t so much as finish in the top 10 in the voting for the Heisman Trophy. "I may not have had a good year in everyone else’s eyes because of what happened. But I feel that I improved tremendously from last year — my touchdown-to-interception ratio, my completion percentage. And I’ve become a better leader of this football team. I demand the guys’ respect on and off the field, in the locker room." That transformation in his personality came to light during one practice session. "A guy ran the wrong route, and I yelled from the top of my lungs," Bridgewater said. "The whole facility got quiet." Whether he’s outspoken or soft-spoken, the Hurricanes know that Bridgewater’s talents and statistics come through loud and clear. "He does a good job of being patient and he throws extremely well on the run," defensive coordinator Mark D’Onofrio said. "He’s only thrown four interceptions so it’s obvious it tells you that he’s making great decisions and is comfortable with their scheme." The first meeting between Bridgewater and the school which once seemed to have him locked up is among several intriguing plotlines to the game. Louisville will join Miami in the Atlantic Coast Conference starting next season. There are close to two dozen players on the Cardinals’ roster with Florida ties. And while Bridgewater is widely viewed as the top quarterback prospect and perhaps the top overall pick in the NFL draft, he has yet to suggest that he’ll bypass what would be his senior season although he has already graduated. "We’re playing a quality opponent," Cardinals coach Charlie Strong said. "We’re playing an opponent who will be on our schedule next year with us going into the ACC. And that’s big. It’s a program that has a lot of tradition. We’re trying to get there. And we’re going to use this as a measuring stick to see how far we need to come." All of the outside attention could faze other quarterbacks. But the Cardinals are confident it won’t disrupt Bridgewater once the game kicks off. "He’s mature enough now that he can handle himself. And he does a great job with it," Strong said.